31 Rue Cambon: Coco Chanel's Fabulous Paris Flat Chanel kept a lavishly decorated apartment above her famous boutique. The grand yet intimate space is filled with crystal chandeliers, gleaming mirrors and personal gifts from her many famous artist friends. The only thing missing is a bedroom — but no matter. 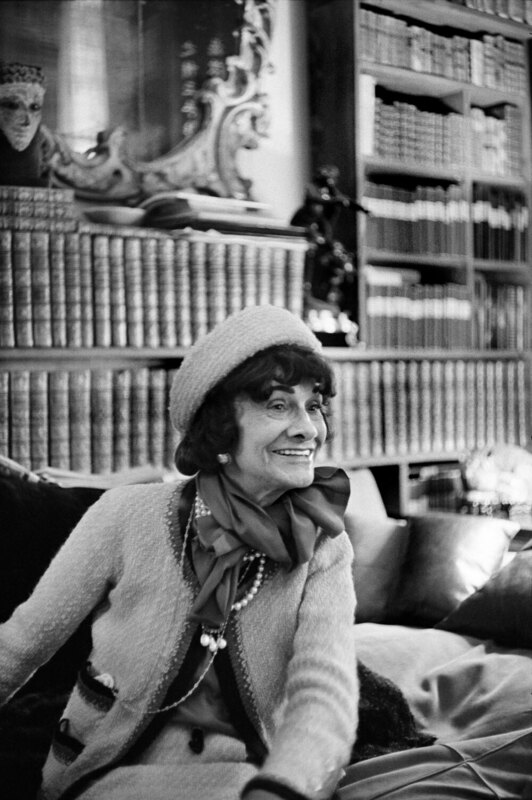 Every night, Mademoiselle Chanel slept at the Ritz. 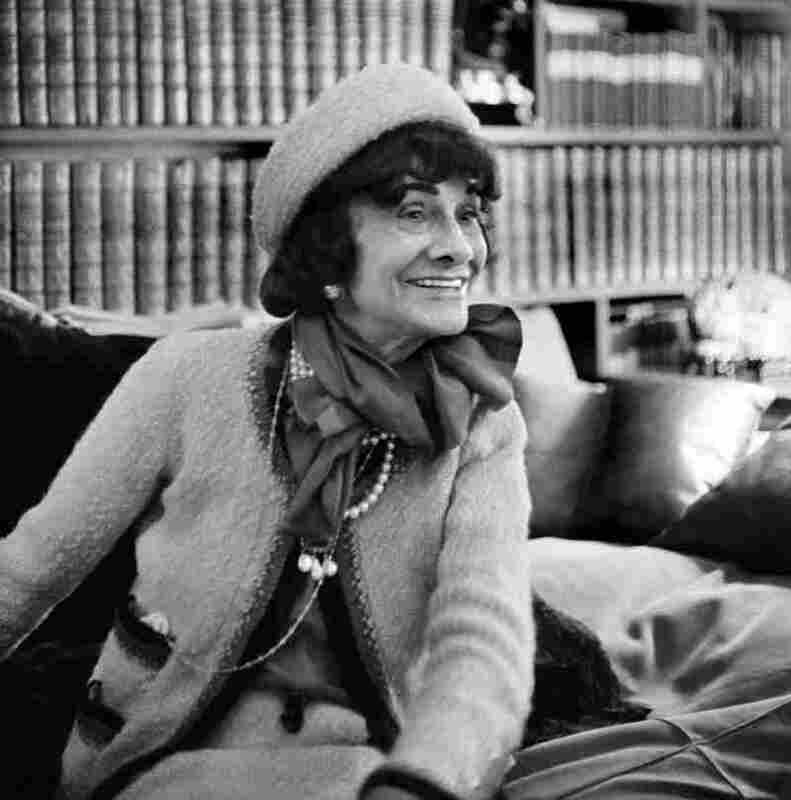 French fashion designer Coco Chanel had a lavishly decorated apartment above her Paris boutique, but it didn't have a bedroom — every night, Chanel retired to her private suite at the Ritz. Coco Chanel invented a fashion vocabulary — camellias, the black dress, the double-C logo, the elongated octagon shape of the Chanel No. 5 perfume stopper — and she surrounded herself with these inspirations in her posh Paris apartment. Located at 31 Rue Cambon, the apartment sits atop the Chanel boutique and couture salon, where models showed collections to prospective buyers. Today, the apartment is used for press interviews and fashion shoots — and, of course, for haute couture clients, says Odile Babin, a Chanel archivist. "In this apartment, you can understand the universe of Mademoiselle Chanel," says Babin — who is wearing a terrific little black, red and white plaid jacket (Chanel, of course). To enter Chanel's universe, you climb a curved staircase, up steps carpeted in beige, with white trim. When new collections were presented, Chanel watched them being modeled from these stairs. During the show, she would sit perched on the fifth step down from her apartment, in front of a wall of mirrors. Looking down, she could see the models and the audience reaction to the clothes — without anyone seeing her. Chanel hated doors, and often placed burgundy-colored screens in entryways. "She hoped that by placing [screens] in front of the door, her guests might not remember to leave," archivist Odile Babin explains. Upstairs, Chanel's apartment is like the nest of an exotic bird. It's filled with antique lacquered Chinese screens — camellias are part of the pattern. Chanel flattened the burgundy-colored screens like wallpaper, or folded them at the entryway to her drawing room. "Mademoiselle Chanel hated doors," Babin explains. "She hoped that by placing them in front of the door, her guests might not remember to leave." A design genius, a self-promoter, a fabulist (she made things up), and afraid of being alone — Chanel was a complicated character. She was born poor, but a series of rich and powerful lovers paved her way to fame and fortune. Among her liaisons were a Nazi intelligence officer during World War II, and the Duke of Westminster — the richest man in England. Some of the duke's lavish gifts, such as three cigarette boxes, sit on a table in Chanel's apartment. She smoked quite a lot — those strong, rich, Gitanes cigarettes. The elongated octagon-shaped cigarette boxes are engraved with the duke's coat of arms. The boxes are silver on the outside and gold, the more precious metal, on the inside — a luxury hidden from view. The idea of "luxury for yourself" was an important Chanel principle, Babin explains. "We call this notion 'invisible perfection.' 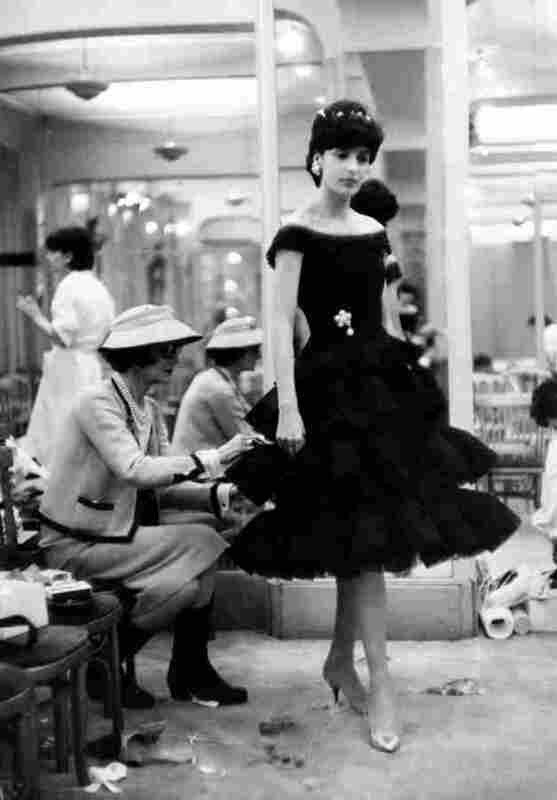 "
Chanel puts the finishing touches on one of her new designs in 1959. Chanel's apartment is filled with visible perfections — crystal chandeliers, gleaming mirrors, pairs of gilded Chinese horses, an ancient Russian icon from her friend Igor Stravinsky, a golden hand her friend Alberto Giacometti sculpted for her, and a shaft of wheat painted by her friend Salvador Dali. It's all very opulent, sophisticated and elegant, and yet the apartment isn't a large or grand space. Though the objects are impressive and luxurious, the apartment feels embracing and intimate. Each room is small, and an important room is missing. "Mademoiselle Chanel never slept here," Babin explains. There is no bedroom. Rather, she had a private suite at the Ritz — with all those Ritzy amenities. Every evening, Chanel left her apartment, walked five minutes across rue Cambon to the Place Vendome, and entered the Ritz through the rear door to retire for the night. Each morning, she crossed back to No. 31. (She'd phone first, so they could spray the salon with Chanel No. 5.) Then, in a mist of expensive perfume, Coco Chanel got back to work.